Drenthe is also spelled Drente. Drents Archief (Drenthe's Archive) is the provincial archive of Drenthe and also maintains the municipal archive of Assen. Address: Brink 4, 9401 HS Assen, The Netherlands. Phone: +31 592 313 523. E-mail: info@drentsarchief.nl. Drentse Historische Vereniging (Drenthe's historical society) is the historical society for the province Drenthe. Drenlias, the provincial database of genealogy records maintained by the Drents Archief, contains many records not available in Genlias. Internet resources Drenthe, an index to the many available online resources for Drenthe. Genealogie Drenthe, a Drenthe genealogy portal site (in Dutch). 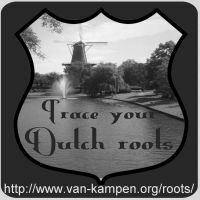 FamilySearch, the website of the LDS (Mormons) has many Drenthe records and scans. Drents fotoarchief (Drenthe's photo archive), in Dutch. Graftombe has indexes of most cemeteries in Drenthe. Register to order photos of tombs. Online Begraafplaatsen (Online Cemeteries) has images of tombstones of several cemeteries in Drenthe.